Our family campground has trick or treat camping, so we created a homemade S’mores family Halloween costume. The marshmallow was made out of a collapsible hamper. I had to tie up the sides to make the hamper shorter and I then cover the whole thing with quilting batting. I cut a hole in the top for head and 2 on the sides for arms. 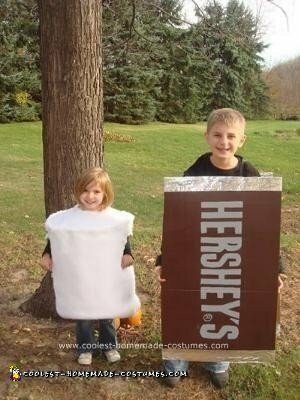 The chocolate costume was just made out of cardboard, spray paint, tin foil and a little bit of ribbon. I cut the cardboard to shape and spray painted it brown. I wrapped the ends in tin foil to look like an actually Hershey bar. My husband FREE HANDED the Hershey letters to look like the package. The crackers were a little boring in comparison to the marshmallow and chocolate, but we had to complete the costume. All we used was cardboard and a marker to make the dots and perforations in the cracker. We made straps out of left over cardboard and just stapled it on! 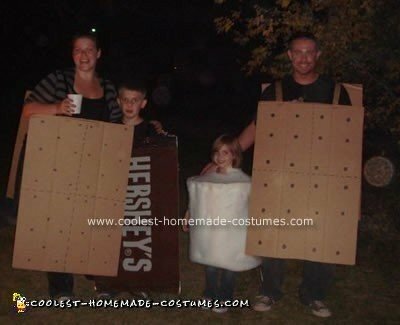 This homemade S’mores family Halloween costume was so easy to make. 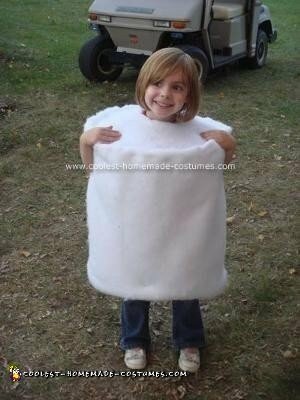 The marshmallow took about 20 minutes and the Hershey costume (not including dry time) took about 45 minutes. And the crackers took about 10. Does the hamper have to be very sturdy? Should I get a higher quality one or maybe find one at the dollar store? Thanks for your help. The costume is super cute! Can you tell me how many feet you used of the batting? Thanks!